I rent a studio in a art gallery. My studio is open to the public so they can come in and watch me. Have you got the jewellery making bug? 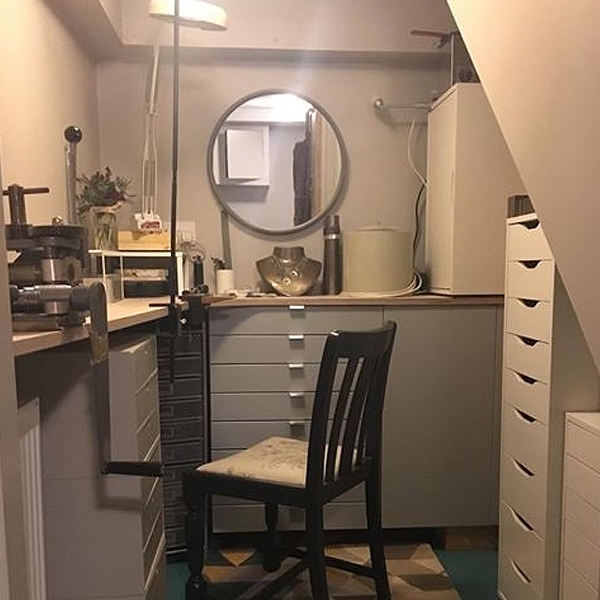 Whether you've just discovered your love for jewellery making or you've been making on the sofa for a year, it could be time to upgrade and create a little space for yourself. The beauty of making jewellery is that you can do it in the comforts of your own home as you only need a small work station. 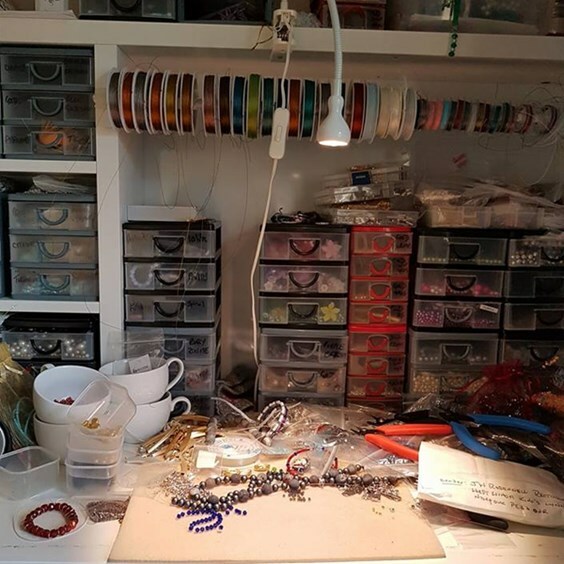 We are always inspired by customers who send us their jeweller’s work space photos and it’s amazing to see how easily you can transform your space. 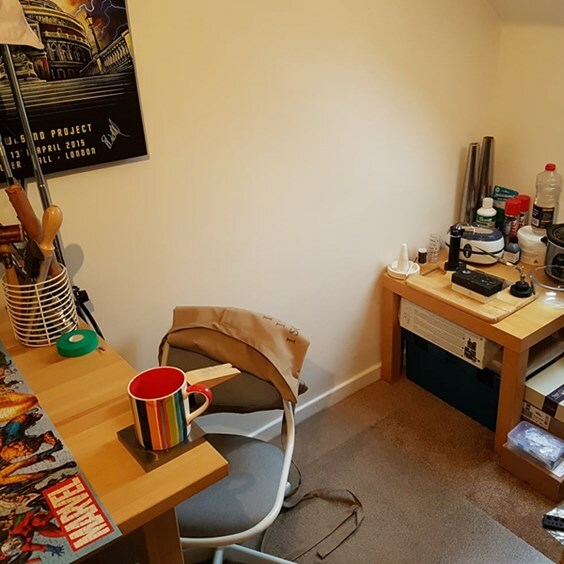 From working in the garage, the garden shed, spare bedroom, the corner of your lounge to a rented studio – every space works, you just need to make it your own. 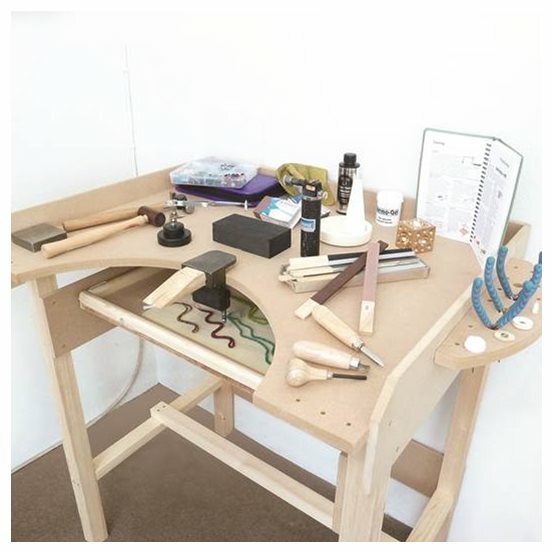 We talk you through everything you need to get started, including silversmithing tools and jewellers bench options. 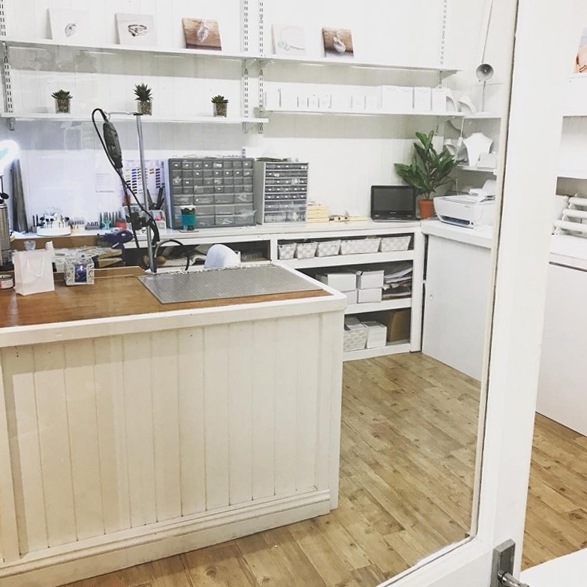 We also show you our favourite customer workshop photos, revealing the variety of ways you can create your own space within your home or a rented studio. 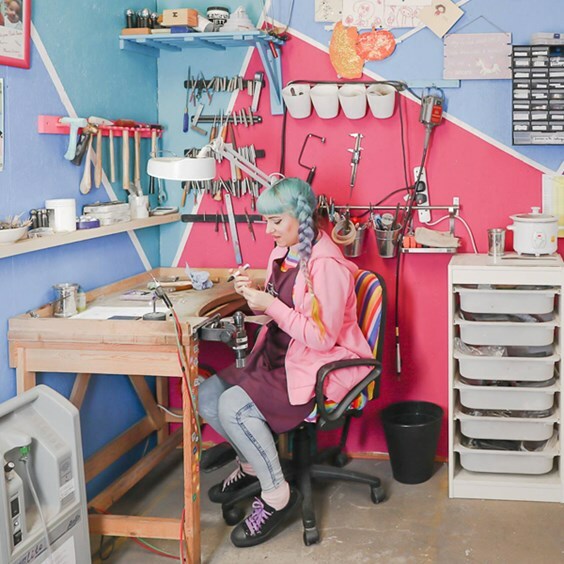 We hope our advice page gives you everything you need to create your very own jeweller's workshop. If you have any questions, do not hesitate to get in touch, we'd love to hear from you! For more inspiration check out Kate from Little Silver Star's Jewellery Workshop Tour over on the Kernowcraft blog! Firstly, where will you be making jewellery? It's all about using your space wisely, although you don't need a huge space, it's important that you have enough room for a work station and room to store your tools and supplies. A spare room, garage space or shed could be the perfect solution. Just take a look at our customer photos with their jewellery workshops within this post for inspiration! Once you have decided where your workshop will be, then the fun can begin with your jewellery making journey. Of course, depending on the type of jewellery you create, you may be happy enough to do this on a lap tray or at the kitchen table. 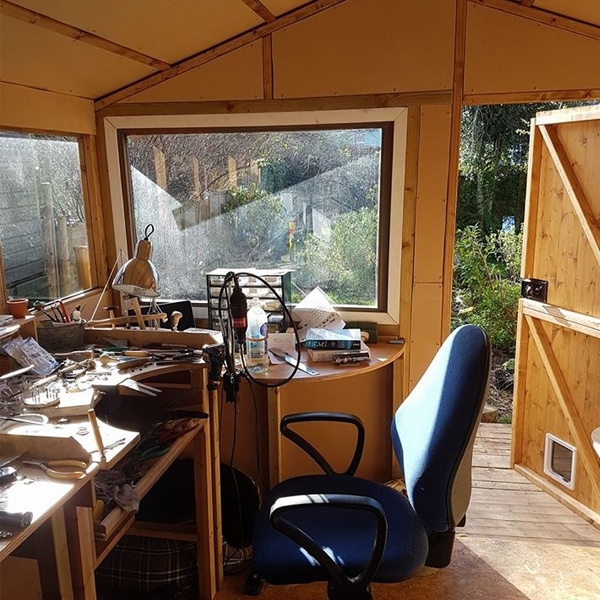 If you are planning on making jewellery at home, on a regular basis and wanting to improve your jewellery making skills with new techniques, a small workbench is a great place to start. 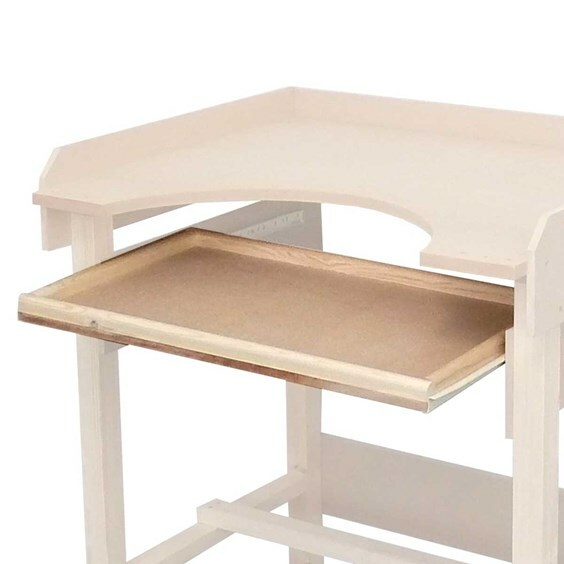 We would recommend using a Jewellers workbench as they are designed to be higher than a standard table, as it stops you hunching over. It's important that you have the correct posture while working and that you are comfortable. Both of the workbenches we offer take only 15 minutes to assemble. You can clamp your anvil and bench pin to the worktop and they have a handy semi-circular tool holder which is ideal for storing extra tools in. They also have metal runners to fit a drawer for extra storage. With Kernowcraft, you can buy an optional drawer with your workbench at a discounted rate. It doesn't have to end there! You could also paint, stain or varnish the bench if you’d like – matching your interiors and making it your own! My little happy space to create is in a corner of the living room. This jewellers workbench is a great starting point for any jeweller making jewellery at home, with a limited budget. If you are making jewellery on a regular basis, it is good to consider the Birchwood bench due to its quality. It is much more robust than the beginners bench and should last you a lifetime with care. An office chair is an ideal seat to use at your bench and is gives you more freedom over what height to sit at, depending on the work you’re carrying out. Many jewellers work through the night so it’s important to have a good light in the room you’re working on. A bendy desktop lamp is a perfect place to start, as you can move this around your bench and place it over the area you are working on. In the future you can look at jewellery and craft lamps, with many coming with a built in magnifying glass to see your work up close. Alternatively, we would recommend our headband magnifier with LED light for those fiddly projects! Another great tip from Cornish jewellery designer, Victoria Walker is to use a daylight bulb to help spot fire stain and other imperfections that aren’t so obvious in poor light. If you are just starting out in jewellery making, our beginner’s toolkit might be the perfect place to start. It’s a fantastic investment if you are really serious about making jewellery and thinking about soldering in the future. Of course, you don’t need to start with all of this. You can always increase the number of tools you have over time, and start with the essentials. I have a studio and I have just decorated it and i love it. 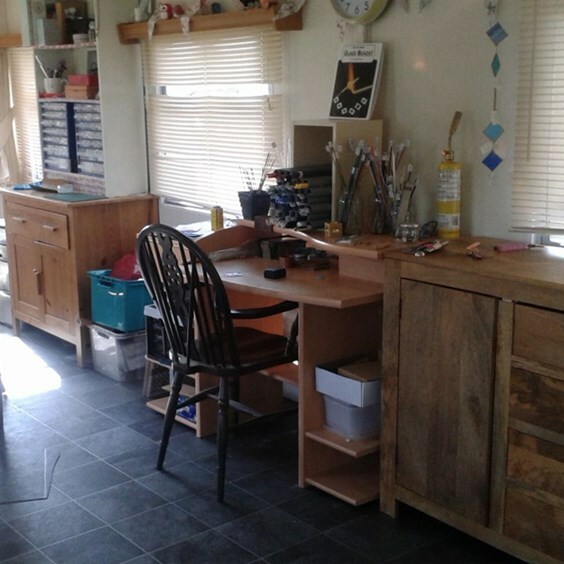 Check out Kate's Jewellery Workshop Tour over on the Kernowcraft blog! My spare room is my studio! Ideally, you will want all of your tools and supplies close to hand and within arm’s reach. You will want to keep most of your basic tools on your bench including pliers, files and tweezers. Depending on how much room you have, you may need to be cautious of space! 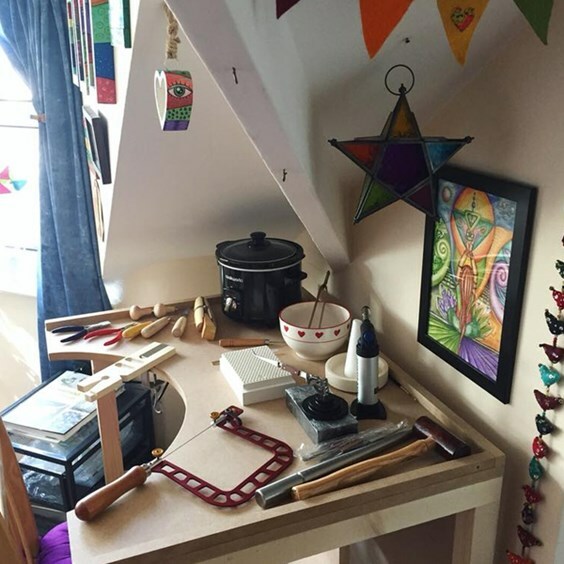 With so many tools, projects and supplies hanging around it can be easy to let things spiral out of control and make it harder to work. There are lots of storage options you can consider such as drawers, shelves and boxes to keep your things organised and safely packed away. When it comes to storing your supplies, our plastic storage boxes come in handy! Especially if you like to keep your beads, gemstones and findings safe. Jewellery making books are great to have nearby your jewellers workshop. Whether you need soldering advice or step by step guidance, it’s always great to have the resources nearby and when in need. If you have the space, why not go for a book shelf? Browse our range of jewellery making books. 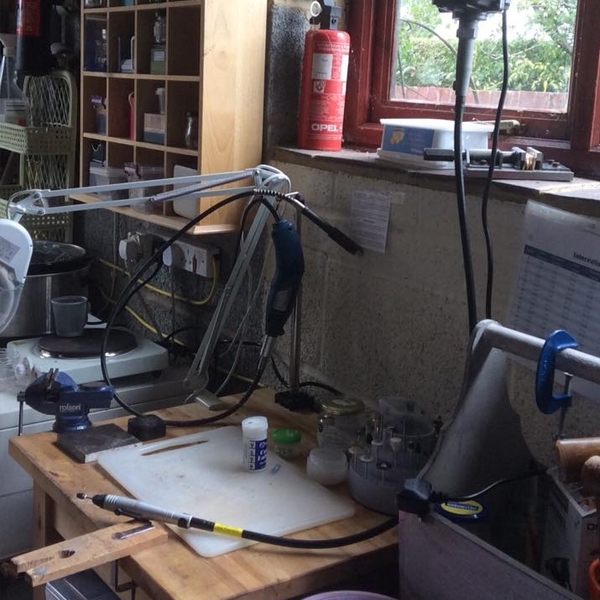 Where ever you decide to have your jewellers workshop, make sure that you make it your own. It could be that you give the space a new lick of paint, or perhaps you want to decorate it to make it your own with bunting, photos, lots of colours or a cosy spot to have a tea break. It’s completely up to you! Take a look at more customer workshop snaps below and don't forget to tag us in your workbench photos on social media with the hashtag #Kernowcraft! "I was "allowed" a corner of my husband's man cave"
I'm very lucky! I have converted a static caravan into workshop space, I do jewellery, lampwork bead making and stained glass in here, and have the room to offer classes here too. My space is at the back of the garage hoping to have a couple of walls built to make my space enclosed. Under the stairs & I’ve almost finished building it. A few finishing touches to do.